Stephen Curry of the Golden State Warriors during a game against the Milwaukee Bucks at Fiserv Forum on Dec. 7, 2018 in Milwaukee, Wisconsin. The Warriors defeated the Bucks 105-95. Steph Curry is sorry for all the trouble his moon-landing comments have caused. On a podcast that aired last week, the NBA superstar said he doesn't believe that humanity actually landed on the moon. 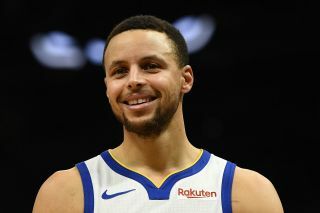 The offhand remark (which was echoed by several other NBA players on the podcast) went viral, prompting a wave of reaction from folks imploring Curry to clarify or repudiate his stance, and to educate himself about NASA and spaceflight history. "Steph, so much respect for you, but re the moon-landing thing, let's talk. DM me," Kelly said to the two-time NBA MVP via Twitter on Dec. 10. The two did end up talking — and not just in private. On Saturday (Dec. 15), Kelly and Curry had a 16-minute conversation, which they streamed on Instagram Live. They talked about the Apollo program, NASA, spaceflight and the importance of inspiring kids to care about science, technology, engineering and math, among other things. Curry said that his podcast remarks were a joke, and he was taken aback by the stir that they caused. "It was a very unfortunate situation for me, because it was a comment that was made in jest and not to be taken seriously," the Golden State Warriors point guard told Kelly. "But the headlines and the reaction kind of took on a life of its own." Curry also apologized to the former astronaut. "I did not want in any way, shape or form to demean the significant accomplishment that you and people that you work with on a daily basis were able to make a reality," Curry said. "I’m obviously genuinely sorry for how that came across." Kelly accepted the apology but also stressed how dangerous it is to feed conspiracy theories, even low-level or silly ones. Doing so can undermine confidence in science as a whole, with potentially disastrous consequences, he said. "What happens is, then, when people believe those things [e.g., the moon-hoax conspiracy], they believe the other things that are more important, like climate change not being real, and vaccines [causing autism], and 9/11 being a government conspiracy theory," Kelly said. Curry, a three-time NBA champion, said he now has a better appreciation of how much weight his words carry. "I never want my comments to put that in question, in terms of people doubting science, even, and how important it is for us to keep moving our society forward," Curry said. Shortly after the podcast aired, NASA offered to give Curry a tour of the lunar lab at Johnson Space Center in Houston, where he can see Apollo mission control and hundreds of pounds of moon rocks lugged home by astronauts from 1969 to 1972. During his conversation with Kelly, Curry said he plans to take advantage of that opportunity, hopefully in the next few months. "I'm definitely looking forward to going to Houston and seeing things up close and personal, and obviously educating myself," Curry told Kelly. "I hope that you're able to be there; hopefully the schedules align, and some more good will come out of this, and more awareness, exactly, of all the great work that's going on inside of NASA."